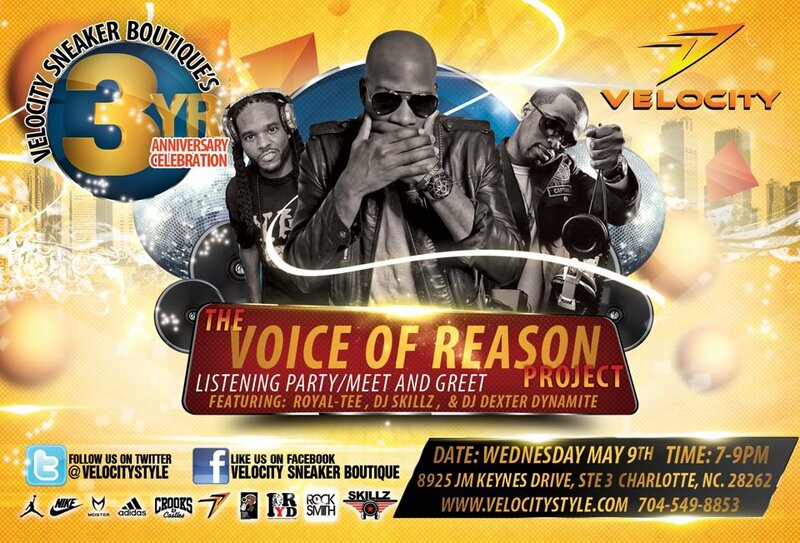 Charlotte rapper Royal-Tee will be unavailing his much anticipated second album Voice of Reason during a listening party/meet-and-greet at Velocity Sneaker Boutique (8925 JM Keynes Drive, Suite 3) on Wed. May 9th. The event will be hosted by the regal rapper himself, DJ Skillz and DJ Dexter Dynamite. Hip-hop fans, support Charlotte-breed hip-hop by attending Velocity Sneaker Boutique’s 3rd Year Anniversary Celebration on Wednesday May 9th from 7-9pm. See above flier for full details. I’m in there! Can’t wait to hear his project! !